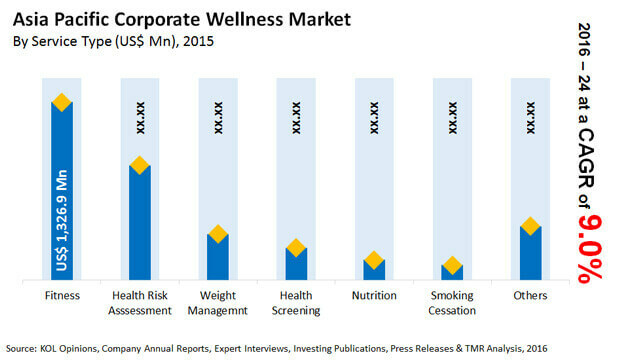 According to the study, the Asia Pacific market for corporate wellness was worth US$3.4 bn in 2015. The market’s opportunity is expected to register a CAGR of 9.0% during the period from 2016 to 2024 and reach a value of US$7.4 bn by the end of the period of the forecast. In 2015, the fitness segment led this regional market, thanks to the augmenting prevalence of chronic diseases, rising medical cost caused by obesity, and the increasing awareness among people regarding health and fitness. However, the smoking cessation segment is anticipated to record a promising growth rate over the next few years, notes the market study.